GI Breeders’ Cup Classic. Despite finishing a lackluster fourth last time in this venue’s GII San Diego H. July 22, Arrogate was hammered down to 3-5 favoritism and Collected was sent off as the 3-1 second-choice along with Accelerate (Lookin at Lucky), who sprung an 8-1 upset in the San Diego with his 8 1/2-length victory. Collected seized the early advantage with Accelerate glued to his hip and Arrogate sitting a close third to that one’s outside through early fractions of :23.76 and :47.19. Arrogate began to back out of it a bit at that point, but still retained third as Collected continued to cruise along on the front end, clocked three-quarters in 1:11.06. The top three were well clear of the rest of the field rounding the far turn and Collected began to skip away from his pursuers entering the lane. Though Accelerate kept plugging away, he never truly threatened, but Arrogate began to show renewed interest as Smith floated him out a few paths in mid-stretch. The “TDN Rising Star” kicked into gear, opening up his massive stride in the final furlong, but his rally came too late and Collected hit the line a half-length clear of his superstar stablemate. Arrogate covered 51 more feet than the winner and clocked his final quarter in :24.90 compared to Collected’s final quarter of :25.42. It was the fifth Pacific Classic win for Baffert, who won in 1999 with General Challenge, 2009 and 2010 with Richard’s Kid and 2013 with Game On Dude, who was also ridden by Collected’s pilot Martin Garcia. Bobby Frankel still holds the record for most Pacific Classic wins with six. Collected is the third Grade I winner campaigned by Speedway Stables, whose colors were also carried by “TDN Rising Star” Noted and Quoted (The Factor) in last term’s GI Chandelier S. and MGISW turfer Hard Not to Like (Hard Spun). Winner of the GIII Sham S. last term, Collected also won the Sunland Festival Racing S., which replaced the GIII Sunland Derby that was canceled due to an EHV-1 outbreak and subsequent quarantine at the New Mexico track. The chestnut followed suit with a victory in the GIII Lexington S. last spring, but faded to 10th behind Exaggerator (Curlin) in the GI Preakness S. and was subsequently shelved. Kicked off this term with a facile victory in the Santana Mile at Santa Anita Apr. 1, Collected captured the nine-panel GII Californian S. with similar ease Apr. 22. He made a mockery of the GIII Precisionist S. last time June 24, strolling home a 14-length winner over stablemate Cat Burglar (Unbridled’s Song) and Accelerate. A $150,000 KEESEP yearling turned $170,000 OBSMAR juvenile, Collected is the eighth Grade I winner, and the third at 10 furlongs, for his late sire City Zip, who was euthanized July 25 at 19-years-old due to chronic foot issues. The winner has a 3-year-old full-brother named Industrialist, who sold for $300,000 at last term’s Fasig-Tipton March sale. Their dam Helena Bay, who won one of her four starts for breeder Runnymeade Farm and Peter J. Callahan, did not produce a foal in 2015, but had a Lookin at Lucky colt in 2016 and foaled a Hard Spun colt Apr. 2 of this year. She was bred back to Triple Crown winner American Pharoah. $1 MILLION TVG PACIFIC CLASSIC S.-GI, $1,000,690, DMR, 8-19, 3yo/up, 1 1/4m, 2:00.70, ft.
($150,000 Ylg ’14 KEESEP; $170,000 2yo ’15 OBSMAR). O-Speedway Stable LLC; B-Runnymede Farm Inc. & Peter J. Callahan (KY); T-Bob Baffert; J-Martin Garcia. $600,000. Lifetime Record: 11-8-1-0, $1,260,500. Werk Nick Rating: A. Click for the eNicks report & 5-cross pedigree. 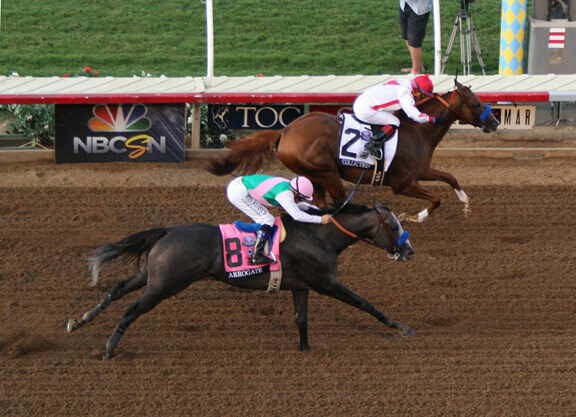 2–Arrogate, 124, c, 4, Unbridled’s Song–Bubbler, by Distorted Humor. 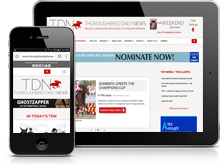 *TDN Rising Star* ($560,000 Ylg ’14 KEESEP). O-Juddmonte Farms, Inc.; B-Clearsky Farms (KY); T-Bob Baffert. $200,000.3–Accelerate, 124, c, 4, Lookin At Lucky–Issues, by Awesome Again. ($380,000 Ylg ’14 KEESEP). O-Hronis Racing LLC; B-Mike Abraham (KY); T-John W. Sadler. $120,000. Margins: HF, 3 3/4, 6HF. Odds: 3.00, 0.70, 3.20. Also Ran: Curlin Road, Hard Aces, Royal Albert Hall (GB), Donworth. Scratched: Sorry Erik.